We had a lovely get-together at Barbara’s and Betsy’s house this past Saturday to celebrate the 10th Birthday of the International Criminal Court (ICC). It is quite amazing what this young institution has accomplished in such a short amount of time (see the accomplishments). Watching The Reckoning brought up many questions. Is the ICC achieving it’s mission of bringing to justice the worst offenders of crimes in the world? Who is responsible for apprehending Bashir now that the court has issued a warrant for his arrest? Even though 111 nations are members of the court, why hasn’t Russia, China and the United States joined? Should the US join? Wrap-up from our Birthday Celebration for the ICC. Planning for our meeting with Congressman Ed Royce’s office this week. What should we do for Genocide Prevention Month next April? Guess who has a birthday coming up? When the Holocaust happened 70 years ago, the world came together to hold the perpetrators of genocide accountable, tried them at the famous Nuremberg trials and said “Never again…”. Sadly, it happened again, in Cambodia (1975), Bosnia (1992), Rwanda (1994), Sudan (2003 and continuing). At the same time, massive human rights violations continue in places like the Congo and Burma where leaders continue to perpetrate horrendous crimes against their own citizens. In an increasingly global and interconnected world, we need strong institutions like the International Criminal Court (ICC) who hold such leaders accountable for their actions. Its mission is to bring to justice persons who have been “accused of the most serious crimes of international concern, namely genocide, crimes against humanity and war crimes”. Next Saturday, July 17th, it’ll be exactly 10 years since the formation of this unprecedented institution. 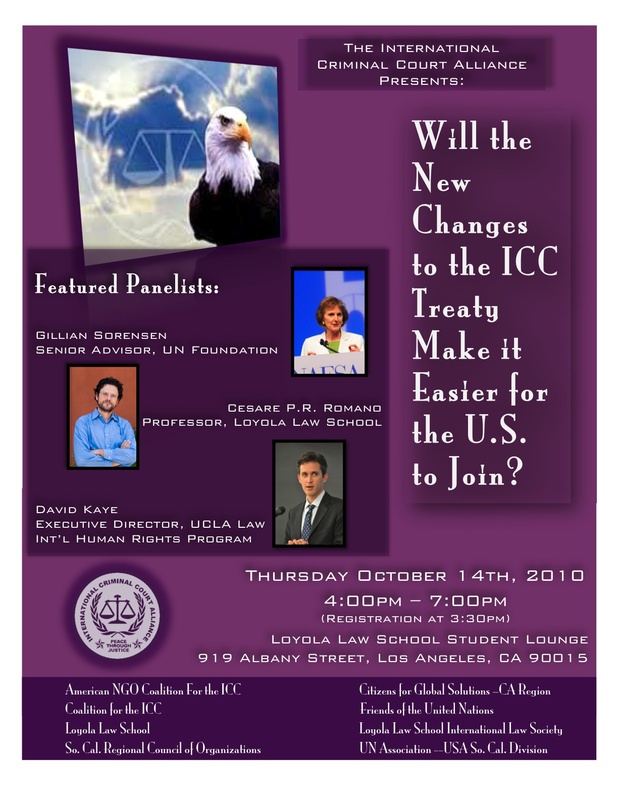 We hope you will join us as we celebrate the 10th birthday of the ICC at Barbara’s house. All details are below. Seating is extremely limited at the house. We can accommodate no more than 20 people. If you’re planning to attend, please RSVP. For more information, please call us at (949) 891-2005. It was quite surprising to see so many people attend Understanding Burma: An Evening With Tim Hardy last Thursday. At best we were expecting 50-70 people given that it was a mid-week event and right before the holiday weekend. Instead, we had over a 100 people attend and raised $427.05!! Thank you everyone for your generous support. This money will be split evenly between Tim’s organization, Burma Global Action Network and us. Wrap up for An Evening With Tim Aye Hardy. Celebrating the 10th birthday of the ICC at Barbara’s house on July 17th. If you’d like to know more about our various activities, please do join us at the meeting.